I love the taste of a good thick cut pork chop, but too often when I was smoking them they came out dry and tough. Have you had this same problem? If so, they can look great one second and the next look like old farm boot shoe leather. Therefore, I was determined to make a great tasting thick boneless pork chop that I would be proud to serve to company. After several failed attempts, I finally discovered the secrets to making boneless pork chops taste great from the smoker, and I decided to share how I do it so that you can make them for your family and friends too. The cook time is relatively short, the prep time is even shorter, and the tender pork chops that you'll get as the result will definitely be worth it. It is hard to find good pork chops at the grocery store to smoke. I really prefer to order heritage chops ahead of time as they come from pigs that have been raised without growth hormones or antibiotics in the fresh air and allowed to graze in a pasture eating whatever they please. Therefore, your meat will have more fat on it which melts when you smoke it leaving the meat juicy and flavorful. If I must buy meat from the local butcher shop, then I make sure that I have them cut about two inches thick. If you get real lucky, then you can find double pork chops in the meat case already cut at your local grocery store. Using thin pork chops is a last resort because they tend to dry out during the smoking process. If you are using heritage pork, then you may not even need a rub as the meat is flavorful, but I still prefer to use a rub to help seal in the juices. Just make sure to not use one containing salt as your pork chops will get too salty. While you can try a variety of barbecue sauces on pork chops, my favorite is a mustard barbecue sauce I make at home. I found it hard to accept that barbecue sauce was not supposed to be red, I like the hint of spice that this mustard sauce brings to the smoked meat. Here is how I assemble my boneless smoked pork chops. Four hours before I am ready to make the pork chops, I combine two cups water, two cups apple cider vinegar, 1/4 cup brown sugar, 1/2 tablespoon ground cinnamon, 1/2 tablespoon black peppercorns, 1/2 tablespoon candied ginger and five cloves in a big pan on the stove. Bring to a slow boil over low heat and remove from stove. Add three cups ice cubes and two cups apple juice. Then, peel and quarter an apple along with slicing up an onion. Add apple and onion to the mixture. Stir until well combined. Pour mixture into a large pan. Add pork chops making sure they are completely submerged. Refrigerate for four hours. In a small bowl, combine the remaining two tablespoons brown sugar, smoked paprika, chili powder, black pepper, garlic powder, onion powder and thyme. Remove the pork chops from the brine and pat dry with a paper towel. Lay them in the pan you intend to carry them to the smoker in. Sprinkle ​spice mixture on top of them, rub pork chops thoroughly.. Then, flip over and do the other side with the rest of the rub. You do not want a hot smoke to smoke boneless pork chops. I like to use a combination of apple and hickory wood chips to smoke my meat. The apple wood adds a sweet hint to the pork chops while the hickory wood adds a smoky flavor. Prepare the smoker to smoke at the cooking temperature of 215 degrees. I prefer to use a separate internal thermometer for my pork chops as the one on the smoker can be unreliable. You can adapt this recipe for any type of smoker: electric smoker, gas grill/smoker, as long as it does its job. I smoke my pork chops until they reach an internal temperature of 145 degrees. This will take about 90 minutes if your chops are about two inches thick. Measure the internal temperature with a meat thermometer at their thickest part. Be careful that you do not push the thermometer clear through the pork chops as they will be extremely tender. Try to make as few holes as possible when measuring the temperature as this allows the meat's juices to escape. When the ​thick chops have reached their internal temperature, remove them from the smoker and place pork chops on a platter. Cover the platter with a tent of aluminum foil being sure that it does not touch the meat. 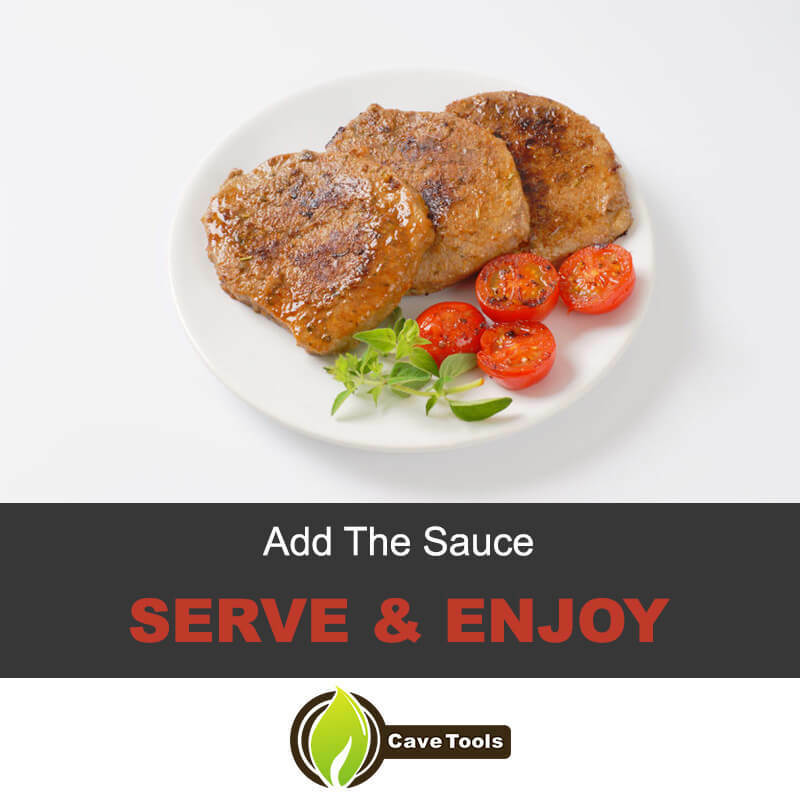 Let the pork chops sit for 10 minutes as it allows time for the juices to be reabsorbed into the meat. Combine the remaining ingredients in a bowl to make the Carolina mustard barbecue sauce. Stir until completely combined. Place each boneless pork chop on a plate. Place a small amount of the sauce next to the pork chop. This allows each person to use as little or as much of the sauce as they desire. I sincerely hope that you have found this tutorial useful. 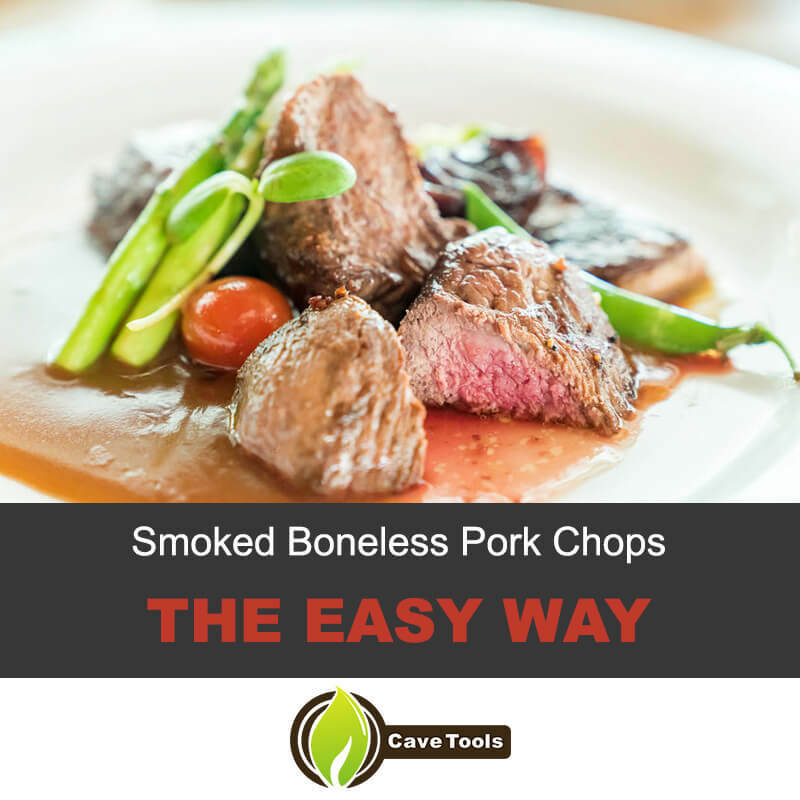 If you have smoked boneless pork chops and have some tips to share, then we would love to hear about your experience. If you have found this tutorial useful, then please share it with your friends and family. Don’t forget to get yourself a copy of Cave Tools Meat Smoking Recipe Journal to write down your cooking adventures! If you are blessed, they will invite you over to eat some of the delicious boneless pork chops that they have created following this tutorial. Alternatively, try it yourself and invite them over to eat your delicious smoking and listen to all the raves. Save this Pork Chop recipe in your Cave Tools BBQ app or download other recipes from the community recipes exchange! ​What Temperature Should Smoked Pork Chops Be Cooked To? ​The USDA allows pork to be cooked to a minimum temperature of 145 degrees F. This is a medium-rare temperature, where the center is pink. The juiciest smoked pork chops are only cooked to this temperature, but you can continue cooking them to 155 degrees F for medium pork chops, and 165 degrees F for well-done pork chops. ​Why Should You Brine Pork Chops? ​Pork chops are a very lean cut of meat. They come from the loin, which is located on the pig’s backside. They often have a layer of fat from the fat cap but they have very little intramuscular marbling. Since they are such a lean cut of meat with little fat, they definitely need a brine to pump them full of salt and water. This will make them juicier and reduce the chances of them drying out as they cook. ​How Long Do You Smoke Boneless Pork Chops? ​We like smoking our pork chops at a lower temperature so it takes longer for them to reach an internal temperature of 145 degrees F. Cooking them hotter than 215 degrees F will cause them to cook quickly so they won’t absorb all that delicious smoke flavor. It should take about 90 minutes to smoke pork chops at this temperature. ​How Do You Serve Smoked Pork Chops? 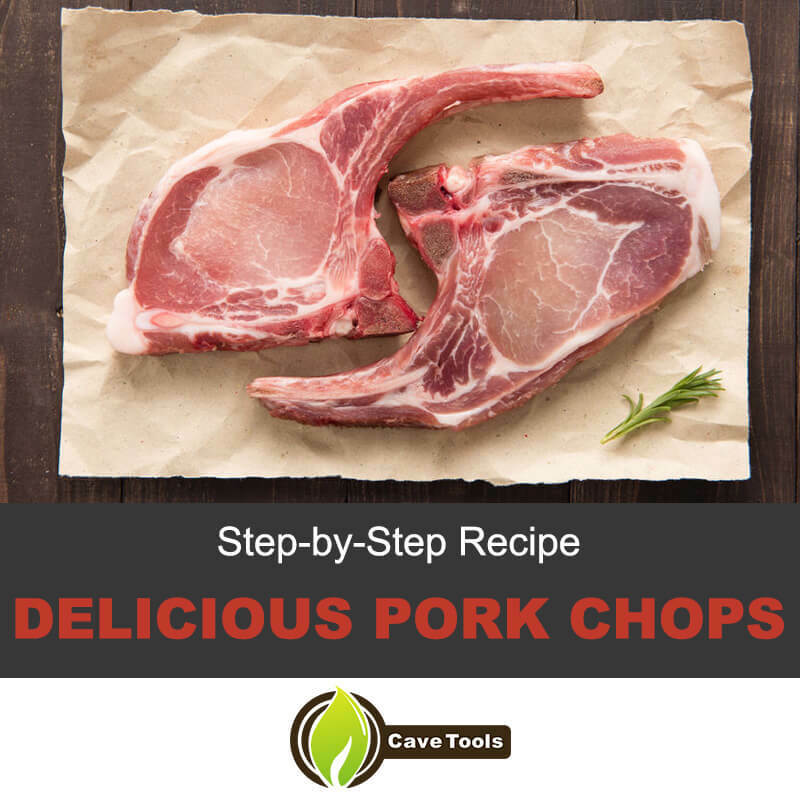 ​You can serve smoked pork chops any way you would serve grilled or seared pork chops. It’s very popular to pair pork chops with applesauce, but we prefer a mustard-forward Carolina barbecue sauce with the smoked kind. The spicy, tangy flavor really adds a lot to the sweet smoke flavor! ​Which Should I Buy, Bone-In or Boneless Pork Chops? ​This is a matter of personal preference. Many people say that a bone-in pork chop has more flavor and is juicier than a boneless pork chop, but we disagree (especially if you’re brining your boneless pork chops). A bone-in pork chop will take longer to cook because the bone is slow to heat, so the meat closest to the bone will take longer to reach the final temperature. Finally, boneless pork chops are more expensive, but you’re also not paying for the bone weight so the price really comes out the same in the end. Do It Yourself Stuffed Burgers Designed For Anyone Who Wants To Eat A New Kind Of Burger. Step by Step Directions Even a Novice Cook Can Follow. Great For Friends, Family, Anyone!